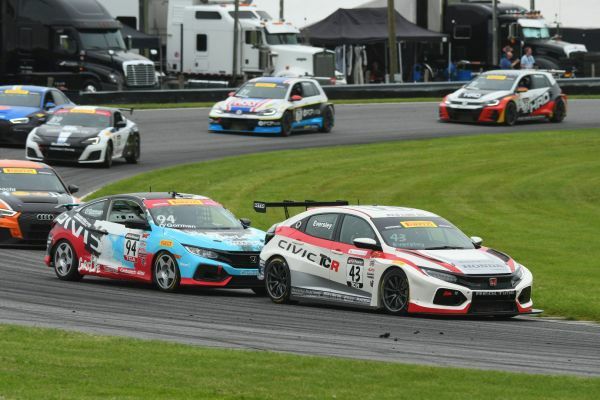 30.05.2018: The third event of the Pirelli World Challenge at Lime Rock Park confirmed that there is a three-way battle for the first ever TCR title in the PWC. The third event of the Pirelli World Challenge at Lime Rock Park confirmed that there is a three-way battle for the first ever TCR title in the PWC. In the first race, RealTime Racing’s Ryan Eversley claimed his second win of the season in his Honda Civic and was quickly imitated by Brian Herta Autosport’s Michael Lewis who won Race 2 in his Hyundai i30 N. Lewis’ teammate Mark Wilkins finished second in both races. With these results, Eversley retained the lead in the standings with 130 points, but Wilkins and Lewis have closed the gaps to four and 13 points respectively. Eversley started from pole position in Race 1 and led for the whole race until it was red-flagged with three minutes left on the clock. Wilkins and Lewis chased him in the early stages and then ran in formation to finish second and third in their Hyundai i30 N cars. In the second race, Lewis – who started from pole position – and Wilkins took command at the start, while Eversley followed in third position. While the two Hyundai cars pulled away, Eversley was given a drive-through for jump-start and then recovered steadily. Eventually he overtook Mason Filippi’s Volkswagen Golf GTI during the last lap for fifth position that became fourth following a penalty inflicted to Jérimy Daniel. Behind the Lewis-Wilkins duo, Ortiz claimed third on his maiden appearance in the Copeland Motorsports Golf GTI. The series will visit Portland International Raceway on July 13/14.